Nothing says autumn like a fresh apple right off the tree (well, maybe roasted butternut squash, or pumpkin, or winter greens…. I love this season!) 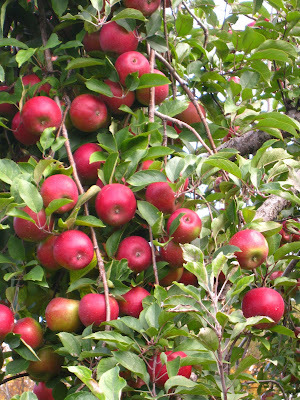 I went apple picking two weekends ago and filled a ½ bushel bag with beautiful, crisp apples. The perfect sunny, clear, and cool fall day just begged for a celebration of fall, and celebrate I did, with a brisk hike, a bountiful apple harvest, and a sundrenched lunch by the Hudson with a great friend. Just a week later, I found myself waxing nostalgic as I looked out on the Northeaster that brought winter weather too early to the city. I decided to shake my cold weather blues by spending time in the kitchen with the apples from my day in the country. I had split the ½ bushel with my friend which left me with about 12 lbs. of apples—more than enough for a huge variety of apple applications! My next couple posts will focus on apples, and I will try to present new and exciting ways to cook them. Apple pie is a favorite for a good reason, but apples are surprisingly versatile and do not need to be pigeonholed to pastry. Apples can add complexity of taste and texture to savory dishes too. Here’s a pilaf of sorts with a very mild flavor, perfect to accompany any autumn meal. Note: This recipe is best with an apple that holds its shape after cooking, think Rome, or Granny Smith. Preheat the oven to 350 degrees. Toss the apples and onions with 2 Tbsp. olive oil and season with sage, salt, and pepper (Don't forget to season with salt and pepper). Distribute the apples across a baking sheet and place in the oven. Bake the apples for about 15 to 20 minutes or until the peel has faded in color and the pieces are slightly soft to the touch (but not mushy!). Stir the apples and onions occasionally to prevent sticking and encourage even cooking. While the apples bake, heat a cast iron skillet, or a heavy bottomed pan. Add the millet and briefly toast the grains in the hot, dry pan. The grains should become very fragrant and start to pop. At this point add the water and bring the pot to a boil. Lower the heat and cover the pot. The grains should be fully cooked in about 20 minutes, but check the pot frequently to make sure the water has not evaporated away and left behind burning uncooked grains. The cooked millet should be light, fluffy, and dry. Combine the apples, onions, and grains in a bowl. Add the additional oil, salt and pepper to taste. Serve hot or at room temperature.